Lately I've been trying to incorporate more vegetables into my family's diet. I'm slowly expanding the palates of my husband and son in this area, my latest acheivement being that my husband now eats carrots. :) One standby though, if I know its not a day to press my luck in the vegetable department, is broccoli. Chris and Jonathan love their broccoli. Consequently, this recipe was an instant hit. I usually add an extra clove or two of garlic, as we love garlic here, but the recipe as is is delicious. 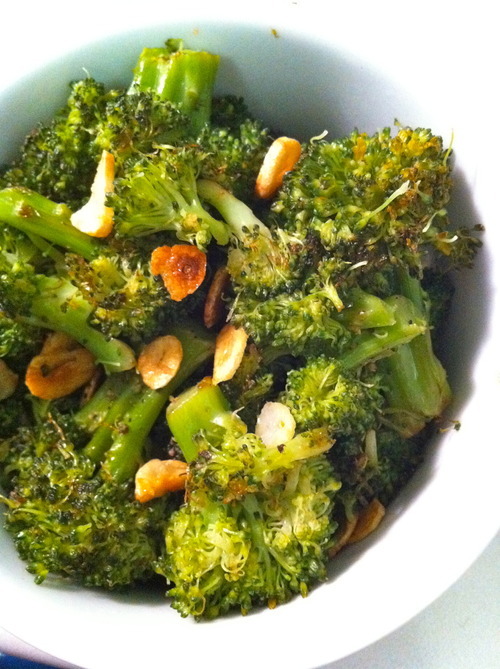 Cut the broccoli into spears and put into a large microwave-safe bowl with the water. Cover tightly and microwave on high for 4 minutes. While the broccoli is cooking, heat the oil in a large skillet over medium heat and add the garlic. Cook the garlic, stirring frequently, until it is golden, about 3 minutes. Take care not to overcook the garlic or it will become bitter. Using a slotted spoon, transfer the toasted garlic to a small dish. Remove the bowl of broccoli from the microwave, carefully uncover it, and drain it in a colander, shaking off any excess water. Transfer the broccoli to the skillet with the oil and cook over medium heat, stirring a few times, for 3 minutes. Sprinkle with the toasted garlic, season with salt and pepper. Serve, and enjoy!